It is the craziest thing. Listen to this. 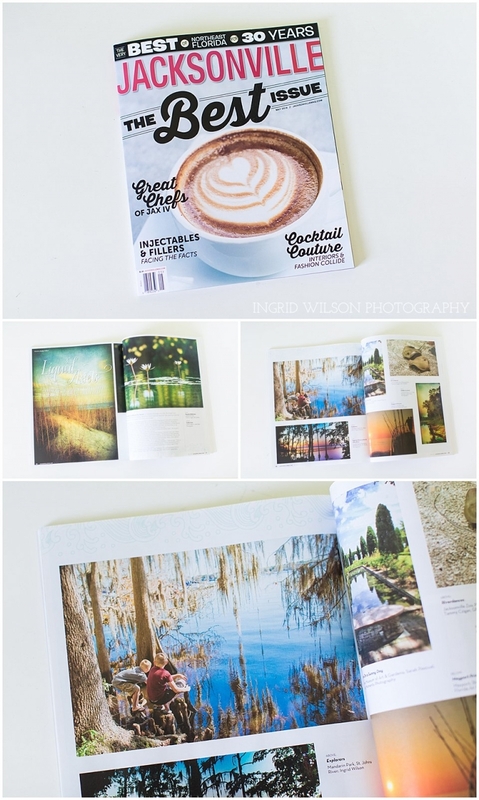 A couple of months ago the Jacksonville Professional Photographers Guild (JPPG) put out an all call to their members for local water-based photographs for an upcoming feature the Jacksonville Magazine was planning. I take pics on all of our Adventure Days and so I had some ready to go. I asked my teen if he minded and he gave me permission to submit this picture of him and his littlest brother (I always ask first). Months went by and I never heard anything and didn’t even think about it again. THIS MORNING I was doing some quick shopping at Publix between morning carpool runs and, because I was chatting with one of my besties on the phone, I didn’t want to check out right away so I decided to flip through some magazines while I stood in the store yapping. After picking out my next house in some coastal cottages magazine, I noticed the May issue of Jacksonville Magazine so I grabbed it and flipped RIGHT OPEN TO MY PICTURE! I had no idea that it was in there. I probably NEVER would have known that it was in there unless I hadn’t randomly happened upon it. I rudely yelled “NO WAY!” while my girly was mid-sentence and had to snap an iPhone picture to send her right away. And then to my hubby. And then to my sister. And then to my other besties. I think I was excited. (Who am I kidding. I am still excited.) I rushed home so I wouldn’t be late getting my teenager to school and to ask him for his autograph, because he is now famous! Ha! I think he rolled his eyes, but it didn’t bother me this time. 😉 My first submission. My first publication. Crazy fun. And an even funnier thing: I had just posted on FB yesterday asking if anyone would be interested in reading about our family Adventure Days throughout the north Florida area and here is one of those adventures in a magazine. Hmmm. Alrighty, well now I’m off to read the rest of the magazine. It’s my fave.